Where’s the best beach camping in California for surfing? We were asking this very question before we set off on our Pacific Coast Highway surf trip in October 2016. Tara and I had been planning a round-the-world surf trip for quite some time and thought–what better way to kick off our big trip than to finally have some extra time to explore our own backyard. It was an epic surf-camping road trip, to say the least! We rented a rad 1979 VW camper bus from Vintage Surfari Wagons and headed out on a Highway 1 road trip north up the coast. We surfed Huntington Beach, Carpenteria, Ventura Point, Emma Wood, Morro Bay and Sand Dollar beach in Big Sur. Being from Southern California, we had already camped and surfed at many sites in SoCal so we’re very familiar. We found not all campsites are created equal. Some have breaks directly out in front with hot showers to warm you up after a cold surf, while others are quite primitive with no amenities at all– some have terrible road noise, and others are nice and quiet so you can rest peacefully with a little privacy. Through our research and first-hand experience, we’ll shed some light on these campsite essentials so you can have confidence when booking your next trip. We’ve rounded up some great campgrounds for surfing the California coast to help make planning your road trip a whole lot easier. REFUGIO STATE BEACH is a very popular campsite and for good reason. The grounds are quite nice with all the amenities one can hope for. Just 20 minutes north of Santa Barbara, this little slice of campsite heaven makes for the perfect weekend getaway. There’s a mellow little right-hand point at the campground beach which is only a few hundred yards from the site. Bring a longboard or a whole lot of extra foam in your small wave equipment as this is a cruise-y roller that needs a solid WSW or WNW to really work. CARPENTERIA STATE BEACH is the closest campsite to the queen of the coast, Rincon. It’s only an 8-minute drive to the world-class right-hand point break, and there are a couple of alright breaks located conveniently within the campgrounds if you’re looking for a quick session or to avoid the crowds. The campgrounds are located smack dab in the heart of the charming and quaint little beach community of Carpenteria, so there’s plenty to see and do if you want to check out the area. EMMA WOOD STATE BEACH offers primitive camping for fully self-contained vehicles only. Tents are not permitted. The only reason we got in with our vintage VW bus rental is that we rolled up without reservations around sunset and no park rangers were there to check us in so we self-checked. In the morning, when we confessed our sins of not having a fully self-contained vehicle, they happily accepted our campsite fee and simply told us we could not stay there another night. We sure were glad to have snuck in under the radar though because it’s a very cool campsite. All the sites are almost directly on the beach and there are a couple of fun breaks within campsite lounging view. SAN ONOFRE STATE BEACH is one of the most visited state parks in California so you’ll have to book way in advance. There is a variety of fun surf breaks for all types of board riders up and down this little stretch of So Cal coast. To the north, you have the rippable more performance waves of Church, Middles, Trestles, and a few others. Directly out front at San Onofre Surf Beach, you’ll find yourself amongst a sea of die-hard long boarders surfing The Point, Old Man’s, and Dogpatch. And to the south, accessible through the campsites on the bluffs you have your pick of peaks scattered across a few miles of coastline with Trails 1 through 6. SAN ELIJO STATE BEACH is right off Pacific Coast Highway in the Encinitas area, more specifically, Cardiff-by-the-Sea. Just like San Onofre, the campsites here go fast so you’ll have to book far in advance. There are a number of breaks out in front of these bluffs, so you can have a look and take your pick. A lower tide is typically better. Longboarders and shortboarders alike are sharing the fun scattered peaks of San Elijo State Beach all year round. You’ll also find yourself right between a couple of iconic Encinitas breaks with Swami’s in view north of the campgrounds and Cardiff Reef to the south. Check out our Guide to Encinitas for our recommendations on restaurants, surf breaks, and things to do when you’re not surfing. PLASKETT CREEK BIG SUR is a camper’s paradise. The campsites are wildly scenic and spread out (if you want even more space and privacy book a site on the outskirts!). Sand Dollar Beach is a leisurely 5-minute stroll away where you’ll find a long stretch of white sand beach with peaks up and down the shoreline. The water in Big Sur is so pristine and clear, and the coastline so wild and rugged, you’re bound to be awestruck by its beauty. Big Sur is a very majestic place– and fickle too. So don’t get your hopes up expecting to score epic surf. But rest assured if you get skunked, the stunning views and pure beauty of the area will captivate you like nowhere else and make everything seem perfectly right in the world. Sand Dollar beach picks up NW and SW swells so you should be able to find something to surf year-round. NW swells tend to be October – April and SW swells tend to be April – October. 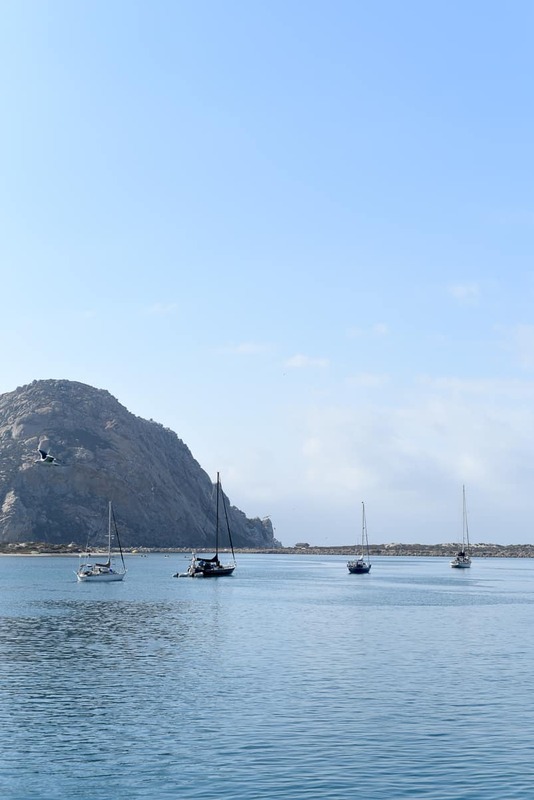 MORRO BAY STATE PARK is a quick 5-minute drive to the famous Morro Bay Rock and surf break. Morro Bay is west facing so it picks up NW and SW swells making it another year-round surf break. The primary peak can offer lefts and rights with the lefts being longer and better on most days. If you don’t feel like competing with crowds closest to the rock, take a walk north on the miles and miles of sandy beach and find a peak with fewer people out. At the end of the day, be sure to watch a breathtaking sunset over the glassy Morro Bay harbor with a drink in hand. Back at your campsite, earplugs can come in handy, as the campsites at Morro Bay SP felt a bit tight without much foliage or anything to muffle sound in between. We felt the wrath of some loud partying neighbors. 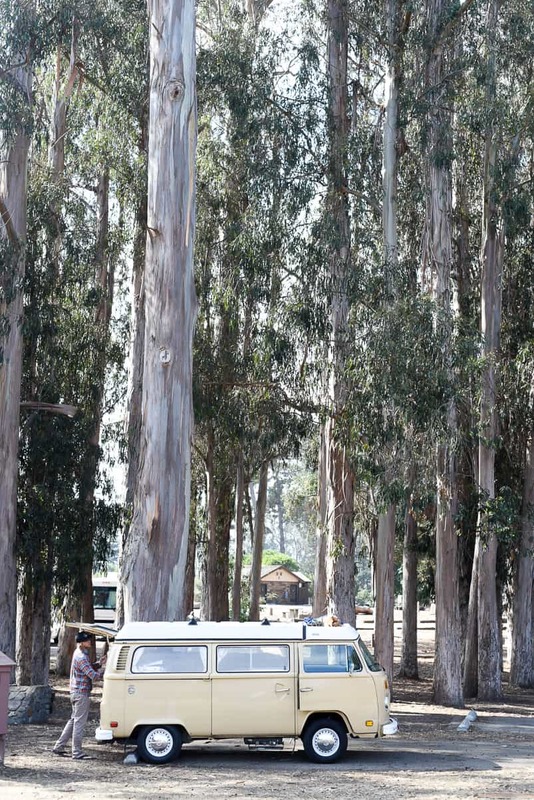 However, the tall eucalyptus trees throughout the site are beautiful and the campgrounds are well kept. 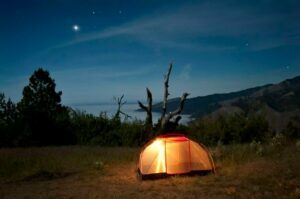 ANCHOR BAY CAMPGROUND is a privately owned campground located along Mendocino County’s scenic Highway One. You’ll be surrounded by native redwood trees, ferns, and other coastal flora. The grounds open up to the half-mile-long Anchor Bay Beach. The site is about a 3-hour drive from San Francisco. HALF MOON BAY STATE BEACH is your spot if you’re one with the elements, as you’re bound to get the full NorCal experience of wind, fog, and crisp damp mornings when you stay here. 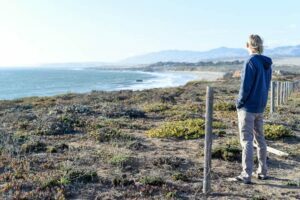 Kelly Ave is one of the best and most consistent surf spots in Half Moon Bay, and you’d be camping on the bluff directly overlooking this beautiful stretch of beach. It’s about an hour south of San Francisco. 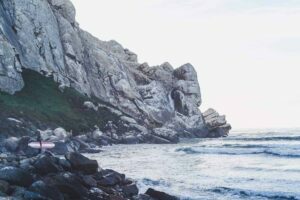 So there you have it folks–some excellent campsite options in California where you’re bound to find some fun waves right out front or at least nearby! Hi Amy! Thanks for sharing, and your recommendations on beaches up north! We’ve yet to visit the Northwest coast, but we’re planning a trip this winter so hopefully we can do plenty of beach exploring and score some waves. Although I’m going to need a serious wetsuit because my tropical-loving self gets cold pretty quickly haha! Happy travels 🙂 !